Sausage Balls Recipe from Scratch - It's Gravy, Baby! I noticed recently that my super quick, easy-peasy original sausage ball recipe is receiving quite a bit of traffic so I thought I would share another sausage ball recipe from scratch. I no longer buy baking mixes or Bisquick so this recipe is now my go-to and it’s as easy and delicious as the original recipe, just with a few more ingredients and some spice. 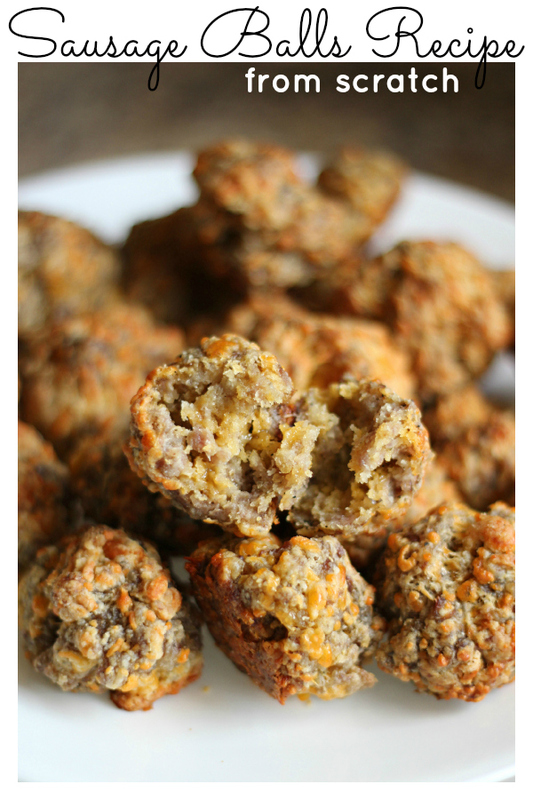 These sausage balls are perfect for an easy snack or party appetizer. Kids and adults love them and they disappear quickly! Preheat over to 400 degrees. In a large bowl, whisk together flour, salt, pepper, red pepper, and baking powder. Add in cheese and toss to coat. Add in sausage, melted butter, and milk, mix well with hands. Shape mixture into balls and place on a greased/ sprayed baking sheet. Bake about 25 minutes, until balls are golden brown and cooked through. I love the added kick from the red pepper. It’s just enough to give them sausage balls a little spice, but not too much. 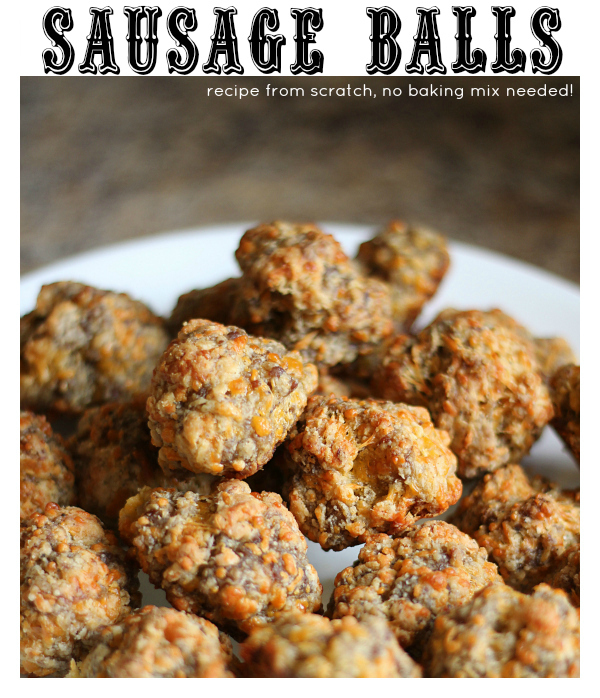 Both Bryson and Bella love this sausage ball recipe. I like to make a batch on the weekend and then we snack on them until they’re gone which is usually by Tuesday. They don’t last long! Thank you for sharing the recipe, looking around for something different for dinner and these look yummy. This looks so good and a great party treat. Oh wow! These look so good! 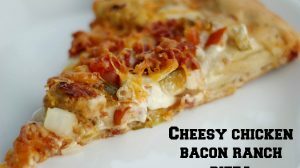 I was trying to think of an appetizer to take to our family get together this weekend, I might have to give these a try! These look delicious!! I’d love to have guests eat these when they come over for Thanksgiving! How do you think these would do with Almond or Coconut flour instead of regular??? I have never used Almond or Coconut flour, so I have no idea. Sorry I can’t be of more help! I don’t know about using coconut flour ( I’ve never found it locally!) but if you eat rice flour you CAN use that. I like to substitute brown rice flour and it works well. These look really yummy and easy to make! Thank you for sharing! Made these tonight. They were easy and delicious! Will definitely make them again! I precooked the sausage a bit to remove a lot of grease. Didn’t need to turn, perfect after 25 min. I went looking for a recipe to make sausage balls without Bisquick, and let me just tell I wish I had been making them this way from the start. They were awesome! My husband absolutely thought they were better than Bisquick. They taste so much more homemade and moist. Every last one of them got eaten at the party! Thank you for sharing your recipe! i forgot our grocery store was closed on Easter. My father requested these I always made mine with Bisquick. This recipe saved me. Thank u! I used this as a “base” for our breakfast this AM. (we didn’t have bisquick so finding this recipe worked out great) I used turkey sausage and added spinach and some egg to ours. YUM. I hate it when someone reviews a recipe but then talks about all the “changes” they made to it first. I made this recipe EXACTLY as it is listed. Yield: 40 one inch balls. I will use a scale of 1 to 5 stars. TASTE: 3 stars, TEXTURE: 5 stars (they look and feel just like Bisquick sausage balls), EASINESS TO MAKE: 5 Stars. I like how the recipe eliminated the trans fast found in Bisquick, but I must say that the first thing I tasted when I popped one in my mouth was Baking Powder rather than sausage and cheese. I will cut baking powder back to a lesser amount next time. Another issue was that the balls were sitting in a mess of sausage fat. Next time, I will use a broiler pan or raise them up on a rack so fat drips down. Next time I will turn them halfway through baking since they got a little too brown on one side. I experimented with using different dipping sauces: Maple Syrup (5 stars), Cinnamon Apple Butter (5 stars), Pizza sauce (4 stars), Blue Cheese ( 4 stars), Brown Mustard (5 stars), Horseradish Mayo (5 stars), Thousand Island Dressing (4 stars), White Sausage Gravy (5 stars). I made one batch with SAGE sausage and they were nice and savory, but still the baking powder overpowered the sage. I will also add chopped onion next time for a little more flavor. A good recipe when you have no Bisquick or want to cut out the trans fat found in it…just lower the amount of baking power! Just made these for me and my son. They are awesome. I used just a tad more red pepper because I like the spice. 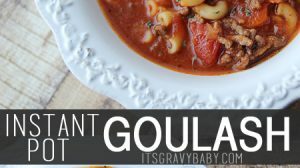 Thank you for this recipe, it was easy and delicious!! I was craving a really good sausage ball (no Bisquick) and your recipe was perfect. Everybody loves them! 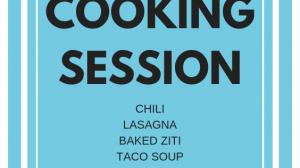 Can you make these ahead and cook them the day of?